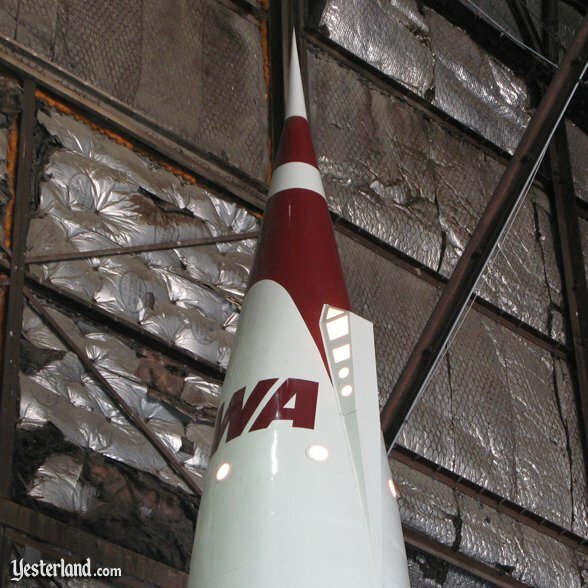 One of my very favorite Yesterland articles ever was about the TWA Rocket to the Moon Moonliner—but not at Disneyland or any other Disney theme park. I hope you enjoy this expanded version. Would you like to travel to the Moon? Consider starting your trip in Kansas City, Missouri. 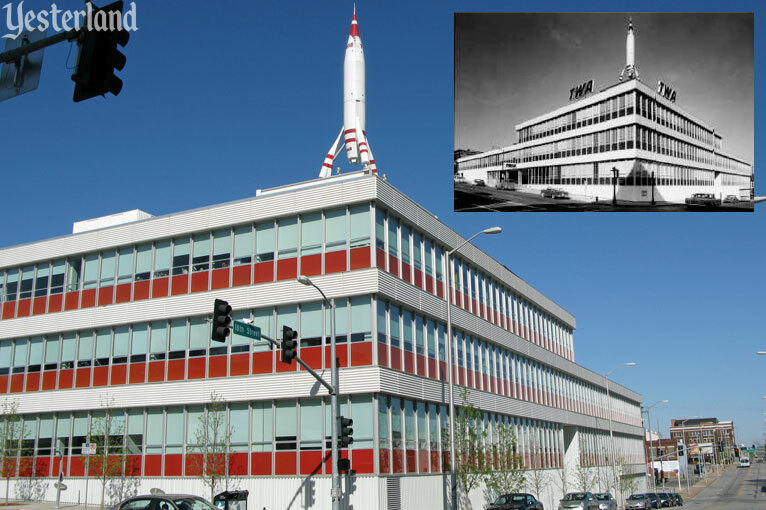 It’s the only the city in America with two TWA Moonliner rockets. This is not a joke—well, the part about traveling to the moon is. But there really are two Moonliners in the city that calls itself the Heart of America. They both look like the Rocket to the Moon Moonliner, which was a Disneyland landmark from 1955 to 1966. From 1955 to 1961, Disneyland’s 72-foot Moonliner sported the colors and logo of TWA, one of America’s largest airlines in the 1950s. Kansas City’s two lunar rockets are just a few miles apart, but their ages are quite different. 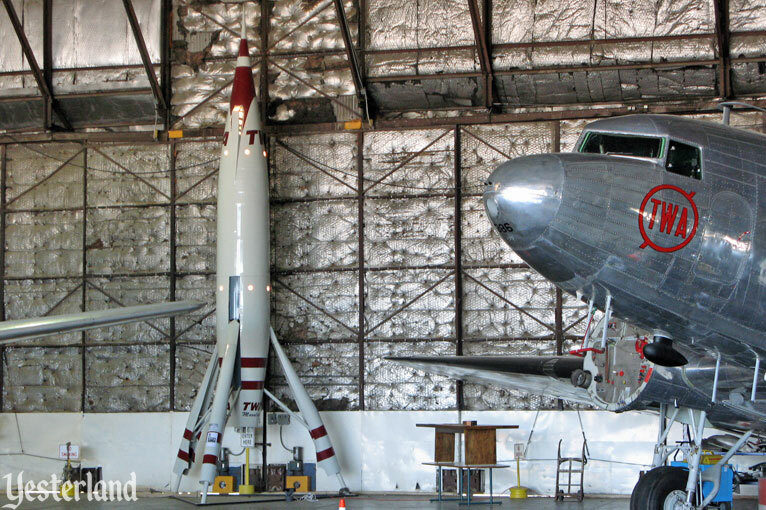 One Moonliner is at the Airline History Museum at Charles B. Wheeler Downtown Airport; the other is on the roof of the Barkley advertising agency building at the corner of 18th and Baltimore. One Moonliner is from the same era as the Disneyland original; the other is a more recent replica. Both have a legitimate reason to be in Kansas City, Missouri. 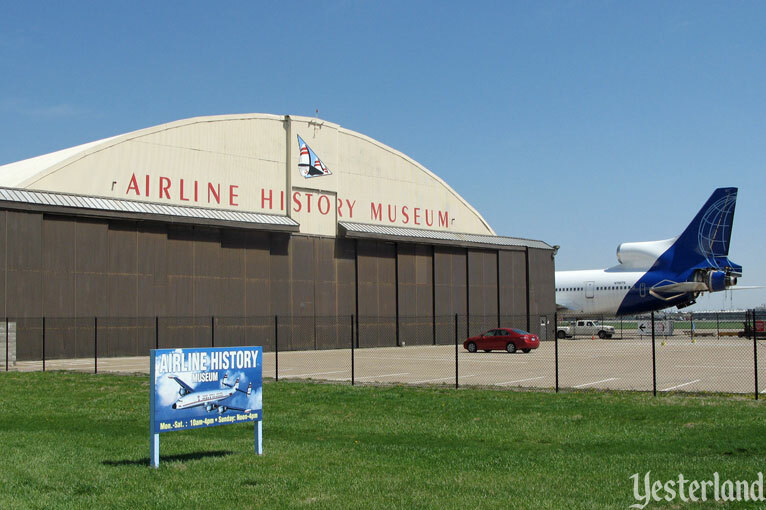 The Moonliner at the Airline History Museum has a history that goes back to 1956. 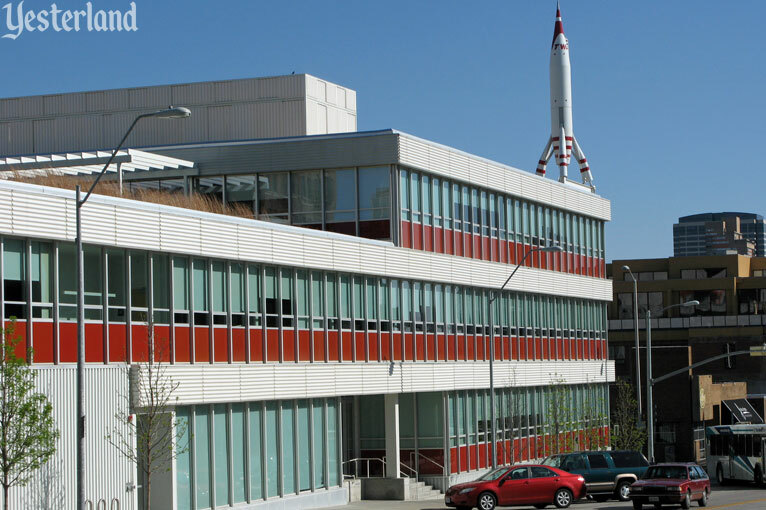 A year after the Rocket to the Moon opened at Disneyland, TWA moved to a gleaming, new corporate headquarters in Kansas City. With dark red aluminum panels below its windows and horizontal, corrugated concrete panels, the building mimicked TWA’s corporate color scheme. It was the dawn of the Space Age. 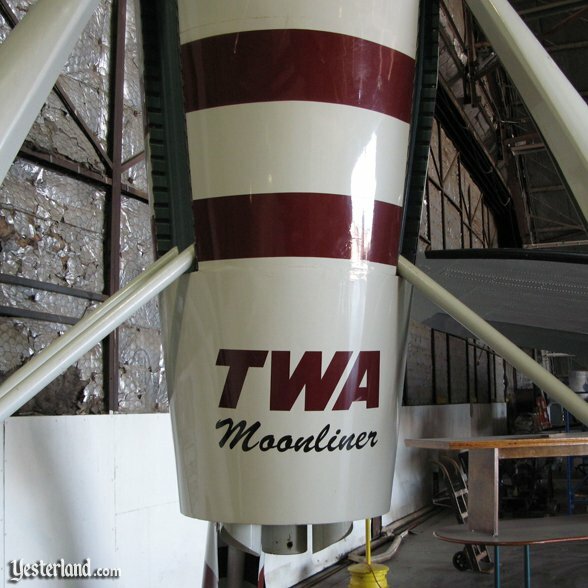 TWA, which had grown from Transcontinental & Western Air to become Trans World Airlines (“the airline that flies three quarters of the way around the world”), foresaw passenger service to the Moon in its future. What better to crown its ultra-modern building than a 35-foot replica of the Disneyland Moonliner? 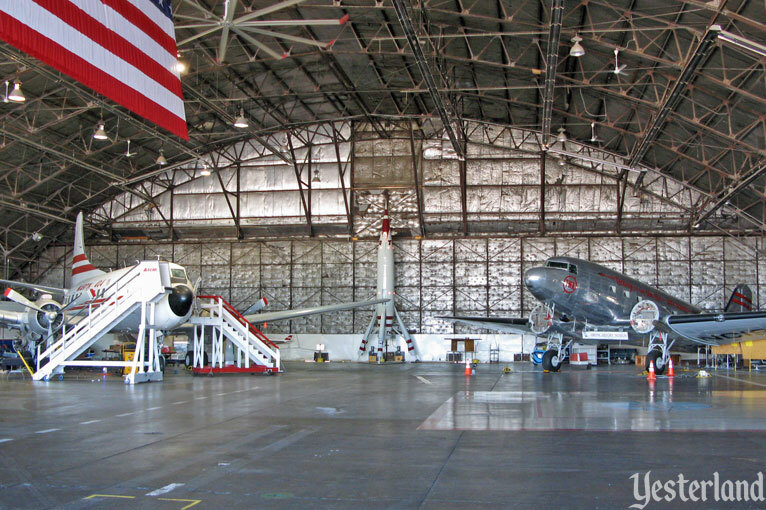 The futuristic rocket on the roof pointed upward to the future—reportedly with the enthusiastic support of TWA’s owner, Howard Hughes. It was later dubbed the Moonliner II by Bruce Gordon and David Mumford, authors of the best Disneyland history book Disneyland: The Nickel Tour (Camphor Tree Publishers, 1995). By the early 1960s, the Moonliners at Disneyland and on the Kansas City rooftop weren’t so futuristic any more. Although the Moonliner’s design by legendary Imagineer John Hench was based on the best input from distinguished rocket scientist Wernher von Braun, the design already looked old-fashioned. It was the age of Project Mercury astronauts being thrust into orbit by Atlas rockets. The graceful Moonliner came across like a Lockheed Super Constellation in the age of Boeing 707 jets. TWA ended its sponsorship of the Disneyland attraction in 1961 and took the Moonliner II off its roof in 1962. 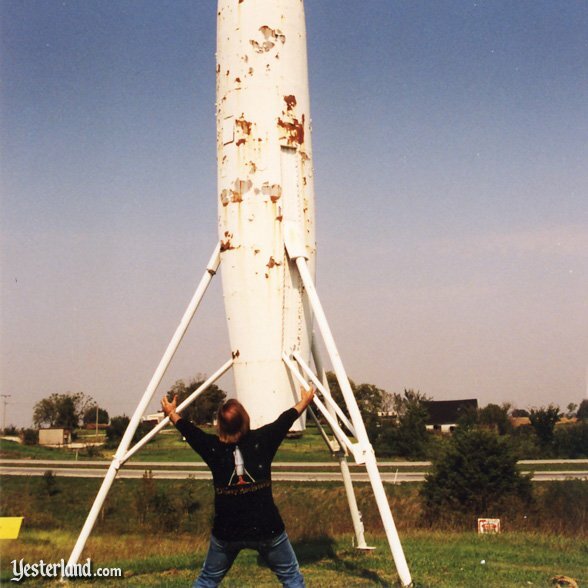 What does a company do with a surplus rocket? 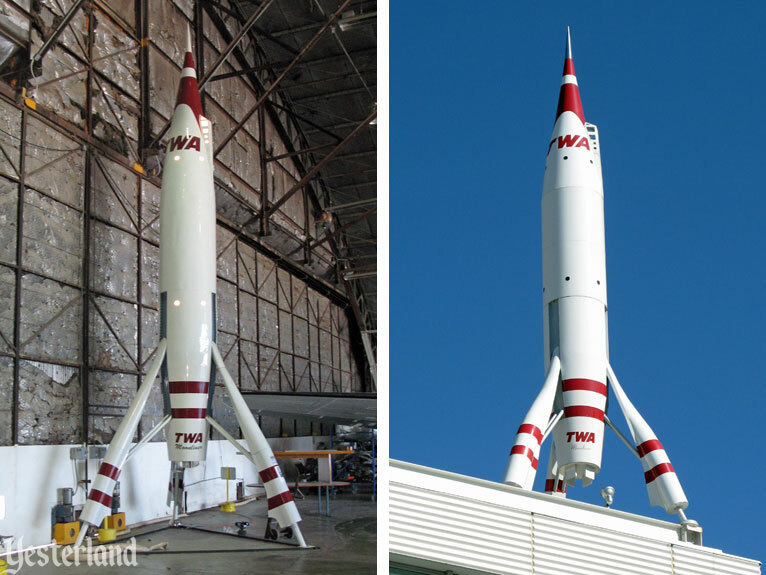 TWA found a buyer, John May, who set it up at his local RV manufacturing firm, SpaceCraft (get it?). A decade later, the SpaceCraft company moved to Concordia, Missouri. SpaceCraft displayed the Moonliner II at its assembly plant there, near an Interstate 70 rest area west of the city. The next 25 years would not be kind to the rocket. With no maintenance, it became unrecognizable. Birds and a large number of wasps built nests inside the cockpit area of the rocket while it stood there. 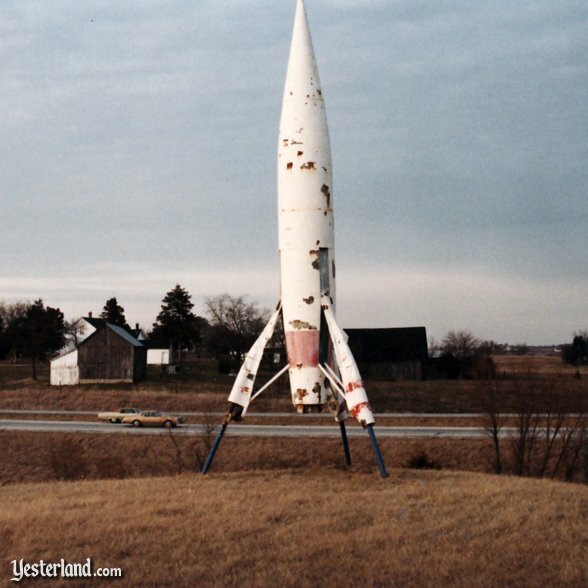 Motorists traveling down the highway would see the deteriorating rocket at the side of the highway with no idea of its glorious past as an optimistic symbol of the future. 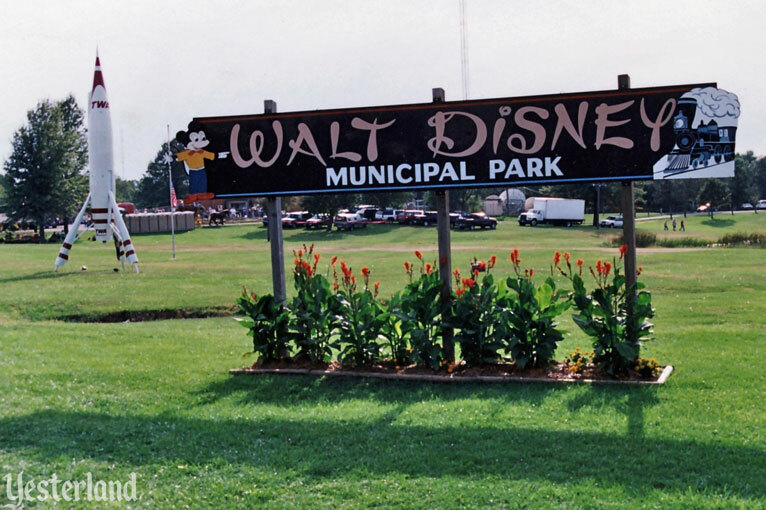 But at least one Missouri resident knew what it was, thanks to the first edition of Disneyland: The Nickel Tour. 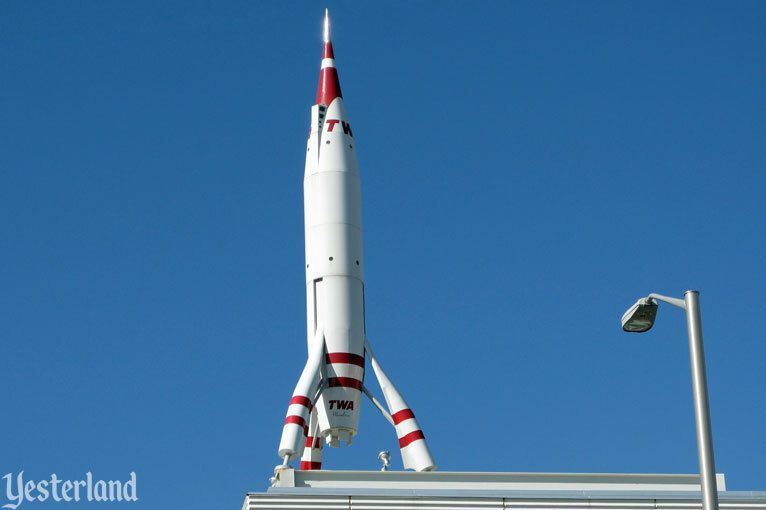 After reading that book, attorney and Disney historian Dan Viets recognized the rocket as the smaller sibling of the TWA Moonliner that had once been a Disneyland landmark. In 1997, Viets bought it. By that time, it was just a rusty mess. The leg shrouds which had covered the “retractable landing gear” were gone. And if bird droppings inside the cylinder would have been suitable as a rocket fuel, the Moonliner II was ready for launch. The name Dan Viets might be familiar to you. Along with two Kansas City Star reporters, Brian Burnes and Robert Butler, Viets co-authored the excellent book Walt Disney’s Missouri: The Roots of a Creative Genius (Kansas City Star Books, 2002). Viets’ leadership was a big part of saving the Laugh-O-gram Building in Kansas City, where Walt Disney had his first professional film studio. And Viets is an outspoken advocate of civil liberties and drug law reform. To tackle the daunting task of restoring the sad-looking Moonliner II to its former glory, Viets turned to restoration specialist Don Jourdan, who worked on it for several years. The results of the restoration were spectacular. For the Moonliner II, it was 1956 again. 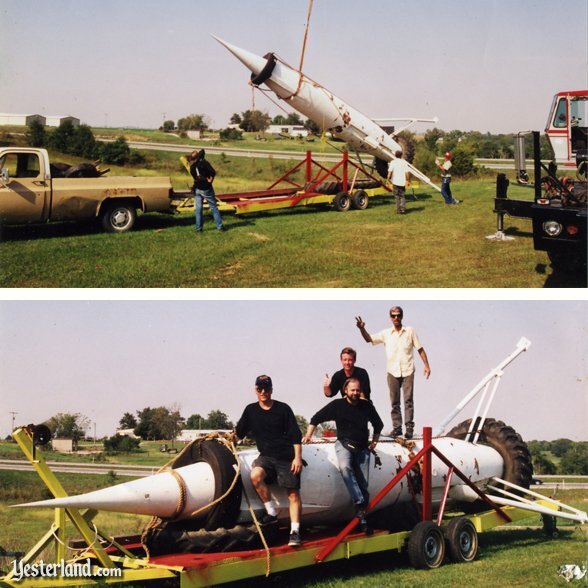 Viets took his Moonliner to Marceline, Missouri in 2001 to celebrate the 100th anniversary of the birth of Walt Disney. The second edition (2002) of Disneyland: The Nickel Tour includes the fact that Viets purchased and restored the Moonliner II. 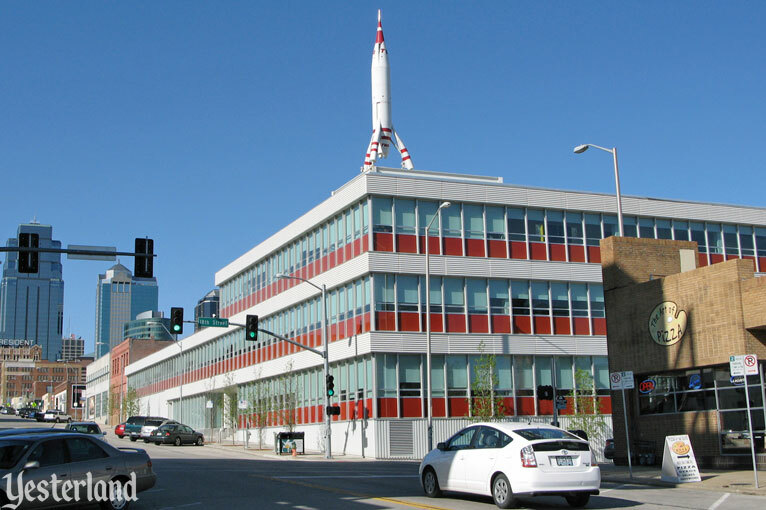 When the Laugh-O-gram building in Kansas City becomes a museum, it would be a great permanent home for the Moonliner II. Although the Moonliner was from a different time in Walt Disney’s life than his first studio, it’s part of the story of Walt Disney’s connections to Kansas City. So far, this article explains the presence of one Moonliner II in Kansas City—but why are there two of them? The answer has to do with the former TWA Headquarters building. 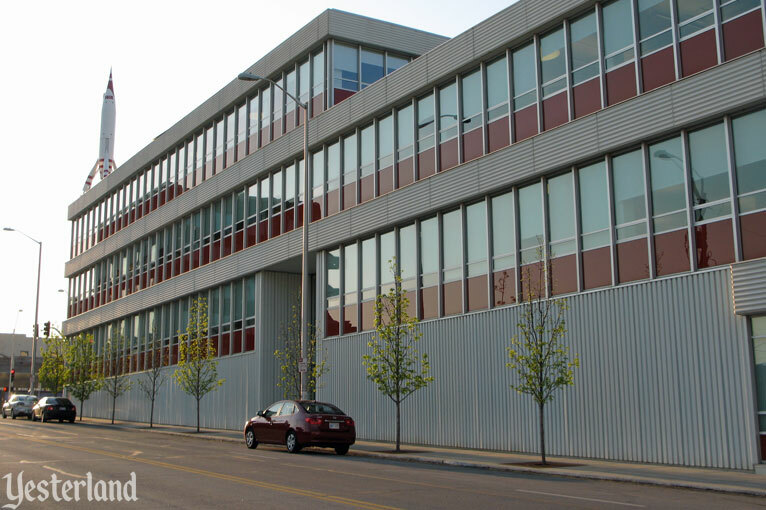 After TWA moved out in 1969, the building suffered. By the 1970s, the red and white building, which had looked so modern when it was built, seemed hopelessly dated. The solution in 1981 was to cover the exterior (including two thirds of the windows) with light brown stucco. The result looked abysmal. In 1988, the building was shuttered entirely. The new millennium brought new interest in the forgotten eyesore. A development company, the Nicholson Group, came up with the idea of restoring the building back to its original appearance. The developer stripped the stucco off the building and worked with the Missouri Department of Natural Resources to nominate it for National Register of Historic Places. It was added to the Register in November 2002. A proper restoration would require the return of the building’s most unusual feature—the Moonliner II at the corner of 18th and Baltimore. Developer Brad Nicholson wanted to buy Dan Viets’ Moonliner II. Viets was initially intrigued with the idea of putting the artifact back where it was originally designed to stand. However, after spending many thousands of dollars restoring it, it did not make sense to leave the original exposed to the elements where it would again slowly deteriorate. Instead, he agreed to allow Nicholson’s architects and engineers to examine the Moonliner II, measure it, photograph it, and attempt to recreate it. A replica was built of aluminum, not galvanized steel. On September 29, 2006, a 20-ton crane hoisted the 2,200-pound Moonliner IV—fifty years newer than the original—onto the roof. It was welded to a steel I-beam frame to make sure it would not blow off the roof. The Nicholson Group found a tenant for the entire building: Kansas City-based Barkley Evergreen & Partners, the largest employee-owned advertising agency in the United States. 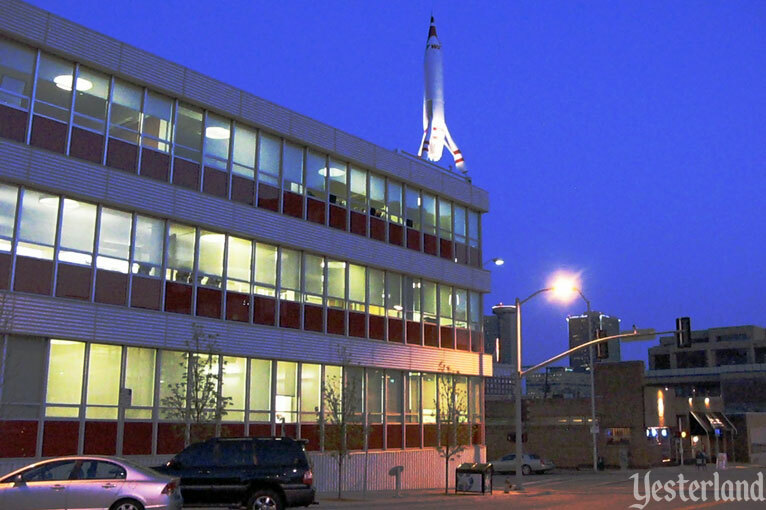 The agency moved to its new “Space Age” home in October 2006 and shortened its name to just Barkley. In addition to a new name and a new address, Barkley adopted a new logo in 2006. When John Hench designed the Moonliner for the 1955 opening of Disneyland, little did he know that he was also designing the basis for a 21st century advertising agency logo. 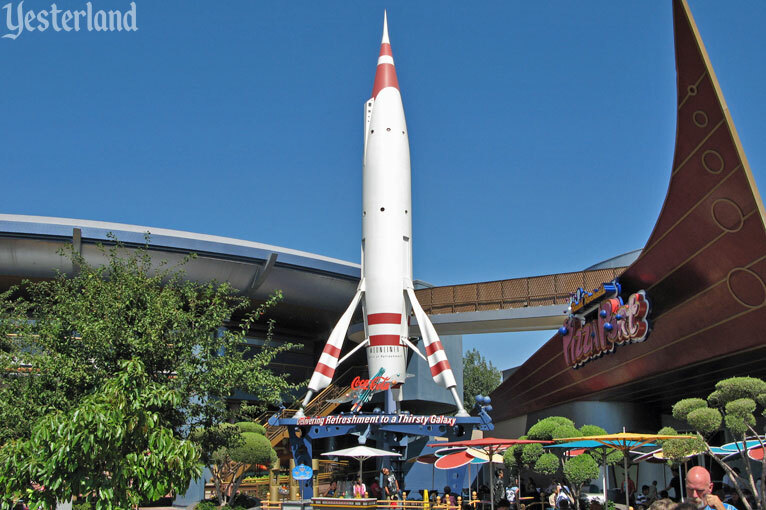 Around the time that Dan Viets was restoring his Moonliner II, Disneyland was building its 1998 “New Tomorrowland,” with Rocket Rods and Innoventions. Plans called for a Moonliner to return to Tomorrowland. More than three decades earlier, the original had been destroyed for the 1967 “New Tomorrowland.” The new, smaller rocket would not be a vision of the future; it would be a nod to the past—Disneyland’s past. By this time, TWA had long given up on taking passengers to the Moon. In 2001, the once-mighty airline would be out of business entirely and its assets would be absorbed by American Airlines. Fortunately, TWA’s red-and-white color scheme and trim were perfect for Coca Cola (just without the TWA logo). If Disneyland ever decides to build a New, New, New Tomorrowland without the current Moonliner, perhaps there would be a place for a third Moonliner in Kansas City. A big thank you to Dan Viets for his help with this article!